These connectors mate with any other standard DB-25 connectors. The DB25 connector is commonly found on computers, electronic devices, DAQ equipment, and industrial controls. On PC's, DB-25 connectors are typically used for RS-232 ports or parallel printer ports. 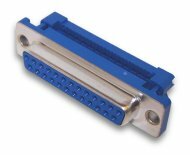 The insulation displacement (IDC) contacts on these connectors allow them to be quickly and easily crimped onto 25-wire flat ribbon cable. 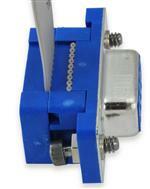 These connectors are available only with Unthreaded Mounting Holes (Hardware option -H-).